Make sure you thoroughly understand the following essential ideas which have been presented above, and be able to state them in your own words. Boyle's Law - The PV product for any gas at a fixed temperature has a constant value. Understand how this implies an inverse relationship between the pressure and the volume. Charles' Law - The volume of a gas confined by a fixed pressure varies directly with the absolute temperature. The same is true of the pressure of a gas confined to a fixed volume. Avogadro's Law - This is quite intuitive: the volume of a gas confined by a fixed pressure varies directly with the quantity of gas. The E.V.E.N. principle - this is just another way of expressing Avogadro's Law. The ideal gas equation of state - this is one of the very few mathematical relations you must know. Not only does it define the properties of the hypothetical substance known as an ideal gas, but it's importance extends quite beyond the subject of gases. The "pneumatic" era of chemistry began with the discovery of the vacuum around 1650 which clearly established that gases are a form of matter. The ease with which gases could be studied soon led to the discovery of numerous empirical (experimentally-discovered) laws that proved fundamental to the later development of chemistry and led indirectly to the atomic view of matter. These laws are so fundamental to all of natural science and engineering that everyone learning these subjects needs to be familiar with them. Robert Boyle (1627-91) showed that the volume of air trapped by a liquid in the closed short limb of a J-shaped tube decreased in exact proportion to the pressure produced by the liquid in the long part of the tube. The trapped air acted much like a spring, exerting a force opposing its compression. Boyle called this effect “the spring of the air", and published his results in a pamphlet of that title. 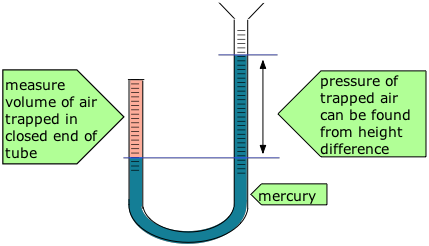 The difference between the heights of the two mercury columns gives the pressure (76 cm = 1 atm), and the volume of the air is calculated from the length of the air column and the tubing diameter. Some of Boyle's actual data are shown in the table. These relations hold true only if the number of molecules n and the temperature are constant. This is a relation of inverse proportionality; any change in the pressure is exactly compensated by an opposing change in the volume. As the pressure decreases toward zero, the volume will increase without limit. Conversely, as the pressure is increased, the volume decreases, but can never reach zero. There will be a separate P-V plot for each temperature; a single P-V plot is therefore called an isotherm. Shown here are some isotherms for one mole of an ideal gas at several different temperatures. Each plot has the shape of a hyperbola — the locus of all points having the property x y = a, where a is a constant. You will see later how the value of this constant (PV=25 for the 300K isotherm shown here) is determined. It is very important that you understand this kind of plot which governs any relationship of inverse proportionality. You should be able to sketch out such a plot when given the value of any one (x,y) pair. A related type of plot with which you should be familiar shows the product PV as a function of the pressure. You should understand why this yields a straight line, and how this set of plots relates to the one immediately above. In an industrial process, a gas confined to a volume of 1 L at a pressure of 20 atm is allowed to flow into a 12-L container by opening the valve that connects the two containers. What will be the final pressure of the gas? Note that there is no need to make explicit use of any "formula" in problems of this kind! All matter expands when heated, but gases are special in that their degree of expansion is independent of their composition. The French scientists Jacques Charles (1746-1823) and Joseph Gay-Lussac (1778-1850) independently found that if the pressure is held constant, the volume of any gas changes by the same fractional amount (1/273 of its value) for each C° change in temperature. The volume of a gas confined against a constant pressure is directly proportional to the absolute temperature. 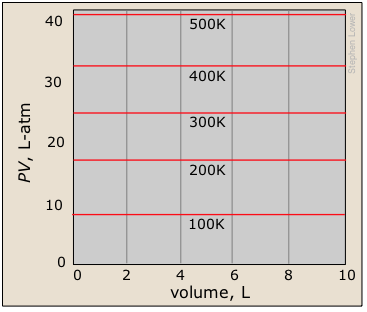 A graphical expression of the law of Charles and Gay-Lussac can be seen in these plots of the volume of one mole of an ideal gas as a function of its temperature at various constant pressures. What do these plots show? What is the significance of the extrapolation to zero volume? If a gas contracts by 1/273 of its volume for each degree of cooling, it should contract to zero volume at a temperature of –273°C. This, of course, is the temperature of absolute zero, and this extrapolation of Charles' law is the first evidence of the special significance of this temperature. Why do the plots for different pressures have different slopes? 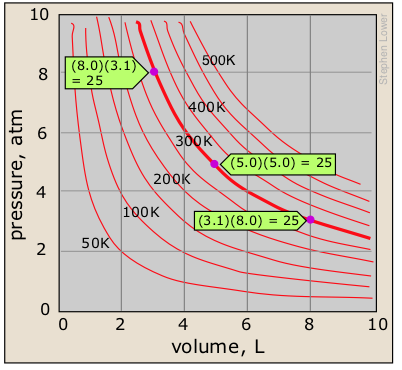 The lower the pressure, the greater the volume (Boyle's law), so at low pressures the fraction (V/273) will have a larger value. You might say that the gas must "contract faster" to reach zero volume when its starting volume is larger. The relation between the temperature of a gas and its volume has long been known. In 1702, Guillaume Amontons (1163-1705), who is better known for his early studies of friction, devised a thermometer that related the temperature to the volume of a gas. Robert Boyle had observed this inverse relationship in 1662, but the lack of any uniform temperature scale at the time prevented them from establishing the relationship as we presently understand it. Jacques Charles discovered the law that is named for him in the 1780s, but did not publish his work. John Dalton published a form of the law in 1801, but the first thorough published presentation was made by Gay-Lussac in 1802, who acknowledged Charles' earlier studies. The buoyancy that lifts a hot-air balloon into the sky depends on the difference between the density (mass ÷ volume) of the air entrapped within the balloon's envelope, compared to that of the air surrounding it. When a balloon on the ground is being prepared for flight, it is first partially inflated by an external fan, and possesses no buoyancy at all. Once the propane burners are started, this air begins to expand according to Charles' law. After the warmed air has completely inflated the balloon, further expansion simply forces excess air out of the balloon, leaving the weight of the diminished mass of air inside the envelope smaller than that of the greater mass of cooler air that the balloon displaces. Jacques Charles collaborated with the Montgolfier brothers whose hot-air balloon made the world's first manned balloon flight in June, 1783 (left). Ten days later, Charles himself co-piloted the first hydrogen-filled balloon. Gay-Lussac (right), who had a special interest in the composition of the atmosphere, also saw the potential of the hot-air balloon, and in 1804 he ascended to a then-record height of 6.4 km. This relationship, originally known as Avogadro's Hypothesis, was crucial in establishing the formulas of simple molecules at a time (around 1811) when the distinction between atoms and molecules was not clearly understood. In particular, the existence of diatomic molecules of elements such as H2, O2, and Cl2 was not recognized until the results of combining-volume experiments such as those depicted below could be interpreted in terms of the E.V.E.N. principle. This conclusion was also seen to be consistent with the observation, made a few years earlier by the English chemists Nicholson and Carlisle that the reverse of the above reaction, brought about by the electrolytic decomposition of water, yields hydrogen and oxygen in a 2:1 volume ratio. where the proportionality constant R is known as the gas constant. This is one of the few equations you must commit to memory in this course; you should also know the common value and units of R. An ideal gas is defined as a hypothetical substance that obeys the ideal gas equation of state. Take note of the word "hypothetical" here. No real gas (whose molecules occupy space and interact with each other) can behave in a truly ideal manner. But we will see in the last lesson of this series that all gases behave more and more like an ideal gas as the pressure approaches zero. A pressure of only 1 atm is sufficiently close to zero to make this relation useful for most gases at this pressure. Many textbooks show formulas, such as P1V1 = P2V2 for Boyle's law. Don't bother memorizing them; if you really understand the meanings of these laws as stated above, you can easily derive them on the rare occasions when they are needed. The ideal gas equation is the only one you need to know. In order to depict the relations between the three variables P, V and T we need a three-dimensional graph. Each point on the curved surface represents a possible combination of (P,V,T) for an arbitrary quantity of an ideal gas. The three sets of lines inscribed on the surface correspond to states in which one of these three variables is held constant. The red curved lines, being lines of constant temperature, or isotherms, are plots of Boyle's law. These isotherms are also seen projected onto the P-V plane at the top right. The yellow lines are isochors and represent changes of the pressure with temperature at constant volume. 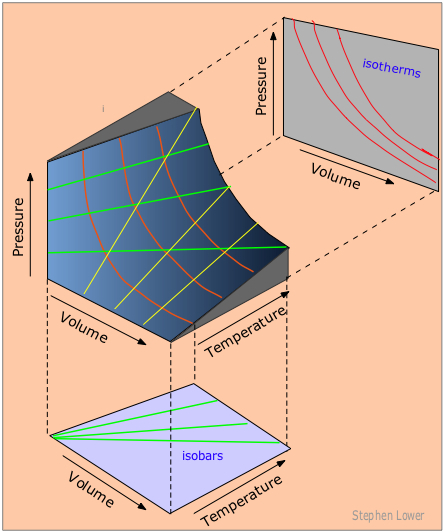 The green lines, known as isobars, and projected onto the V-T plane at the bottom, show how the volumes contract to zero as the absolute temperature approaches zero, in accordance with the law of Charles and Gay-Lussac. A biscuit made with baking powder has a volume of 20 mL, of which one-fourth consists of empty space created by gas bubbles produced when the baking powder decomposed to CO2. What weight of NaHCO3 was present in the baking powder in the biscuit? Assume that the gas reached its final volume during the baking process when the temperature was 400°C.